This seventh book in the acclaimed Warlord’s Series takes young readers on another mathematical adventure in ancient China. 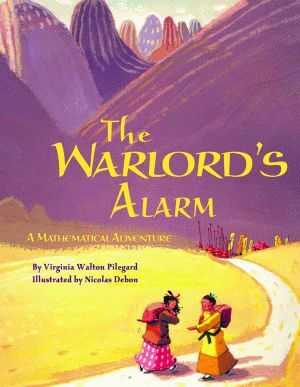 Acclaimed for its unique and artful approach to introducing math concepts to young readers, each Warlord’s book encourages children to use their imaginations and math skills to find solutions to the characters’ dilemmas. In The Warlord’s Alarm, Chuan and Jing Jing are worried they won’t be able to wake the warlord before the sun rises. They are traveling to the emperor’s palace, and they can only sleep four hours before resuming their journey in order to arrive as the emperor’s gates open. There are no clocks at the inn where they are staying, so they must create their own alarm clock. Displaying the ingenuity shown in the previous six Warlord’s Series books, Chuan and Jing Jing turn their water bag into an alarm clock and awaken in time to rouse the warlord. Like each book in the series, The Warlord’s Alarm includes instructions for making a math-related craft. Following Chuan and Jing Jing’s success, children are encouraged to make their own water clock. 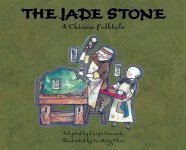 The Warlord’s Series includes The Warlord’s Puzzle (activity: tangram puzzle), The Warlord’s Beads (activity: abacus), The Warlord’s Fish (activity: compass), The Warlord’s Puppeteers (activity: puppets), The Warlord’s Kites (activity: kites), and the The Warlord’s Messengers (activity: windsock), all available from Pelican. Virginia Walton Pilegard completed both a BA and MA in education with a mathematics emphasis. She has worked as an elementary-school teacher and is a member of the Society of Children’s Book Writers and Illustrators and the California Mathematics Council. She lives with her husband in the foothills of California’s central Sierra Nevada Mountains. Nicolas Debon is a freelance illustrator in Versailles, France. In addition to his illustrations for the Warlord’s Series, he is also the author/illustrator of several other books, including two Canadian Governor General’s Literary Award finalists. Part adventure story and part mathematical puzzle. . . this historical tale. . . provides an engaging introduction to the functions of clocks.